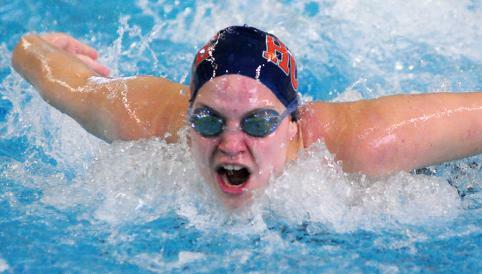 Three individual titles highlighted Day 3 of the Michigan Intercollegiate Athletic Association Championships for the Hope College women’s swimming & diving team. Sophomore Molly Meyer of South Bend, Indiana (John Adams HS), claimed two of them Friday at Holland Community Aquatic Center, while junior Jorgie Watson of Grand Rapids, Michigan (Catholic Central HS), earned one. The Flying Dutch are second place in the overall standings with 482 points. They trail defending champion Calvin by 24 points heading into Saturday’s finale that begins with 10 a.m. preliminaries. Kalamazoo is third with 480 points. Meyer repeated as MIAA champion in the 100 butterfly with a season-best time of 57.86 seconds. Freshman Natalie Vela of Clarkston, Michigan (Clarkston HS), finished fifth in 1:00.34, while Katie Smith of Mokena, Illinois (Lincoln Way East HS), was 10th in 1:02.40. Meyer captured the 100 backstroke championship by clocking a time of 57.68 seconds. She set MIAA and school records in the event on Thursday during the 400 medley relay. Teammates Klare Northuis of Holland, Michigan (Holland HS), and Hannah Larson of Jackson, Michigan (Jackson HS), placed fifth and sixth, respectively, in 1:00.12 and 1:00.87. Michelle Hance of Noblesville, Indiana (Noblesville HS), came in 11th at 1:02.35. Senior Lauren Girard of Rockford, Michigan (Rockford HS), was 15th at 1:04.43. Watson won the 100 breaststroke with a NCAA Division III B cut time of 1:05.31. Teammate Taryn Gras of Zeeland, Michigan (Zeeland East HS), was 13th in 1:11.41. The 200 medley relay of Meyer, Watson, freshman Chloe Palajac of Dearborn, Michigan (Dearborn HS), and Northuis were runner-up after posting a time of 1:46.92. Palajac and junior Lindsay Wiederhold of Plainwell, Michigan (Plainwell HS), took third and fourth, respectively, in the 400 individual medley with swims of 4:33.36 and 4:36.03.
junior Kaleigh Mullen of Rochester, Michigan (Pontiac Notre Dame Prep), in ninth at 1:59.48 and junior Virginia Cotterall of Spring Lake, Michigan (Spring Lake HS), in 14th at 2:01.56. Diver Jean Luc Miralda secured runner-up honors in 3-meter diving at the Michigan Intercollegiate Athletic Association Championships on Friday by surpassing his school record with a six-dive score of 544.85 points.